Which cities in the region are leading the way toward becoming urban centers of innovation and using technology and civic policy to create better lives for their citizens? • Top 10 Smartest Cities In Asia/Pacific. 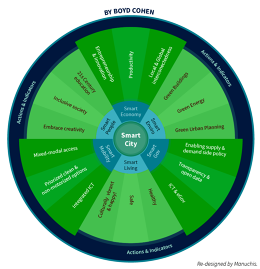 As I’ve written before, all smart cities are on the journey towards being smarter, but none of them have arrived. This statement could not be more true when discussing smart cities in Latin America. I must admit I have a soft spot for the region. For the past two years, I have lived in two of the top 10 cities, and visited several others frequently. But Latin America is still a developing region and this list is primarily made up of cities in developing countries, unlike the rankings for North America, Asia/Pacific, and Europe. Therefore, most of these cities have major problems with traffic, contamination, government inefficiency, and much less transparency than you’d find in leading cities in more developed regions. Latin American cities also have a bad track record in proper land use and urban planning. Having said that, all of the cities on this list are making strides towards becoming more efficient, cleaner, more innovative, and yes, smarter. I moved to Santiago in April of this year, and although there are significant advances in many relevant areas for smart cities, I must admit, I was even surprised to see Santiago land the top spot when all the data was in. Santiago struggles with air contamination, particularly in the winter due to inversion caused by the surrounding mountains. Like most cities on this list, Santiago also struggles from traffic congestion and urban sprawl. The task of making Santiago smarter is even more difficult due to the fact that it is made up of 34 independent communities, each with its own mayor. Despite the challenges, Santiago has several advantages in its quest to be smarter. First of all, Chile has the least corruption of any government in Latin America while maintaining low inflation and a stable economy, making it the most attractive country to do business in the region. This trickles down to its capital. Santiago has been regularly ranked the number one city in Latin America to do business, has a high quality of life and is increasingly becoming a hotspot for entrepreneurship. In fact, due to programs such as Startup Chile, Santiago’s entrepreneurial ecosystem was recently ranked amongst the top 20 in the world. There is more to Santiago’s number one ranking than a stable government and support for entrepreneurship, however. In the past year, Santiago has had several key stakeholders take on the smart city challenge including a nonprofit called Pais Digital, a research think tank called Fraunhofer, my university, Universidad del Desarrollo, and the Ministry of Transportation and Telecommunications (MTT). Several events have taken place focused on building a vision for smarter cities and implementing pilot projects. While congestion is not good in Santiago, the metro system is, and has the highest per capita use in the region. Some of the communities have implemented bikesharing programs, including a recent collaboration with B-Cycle (a U.S. Company) and Banco Itau. The largest energy company, Chilectra, has taken on several pilot projects including Smart City Santiago in a business park where they are testing everything from smart grids to EVs, and are starting a pilot to support an EV car-sharing program, which would be the first of its kind in Latin America. Staying on transit, the MTT has been testing several smart solutions including variable automated toll pricing on the highways, utilizing USB sensors to track traffic congestion, and developing control centers to monitor traffic in real time. Truthfully, at first glance, Mexico City is another surprise to be so high in this first Latin American smart cities ranking. It is a huge city with all the problems large cities in Latin America have. Yet, in recent years, Mexico City has actually been a pioneer in the region in several areas associated with smart cities. Leveraging data from the Digital Governance research by faculty at Rutgers University, as well as analyzing open data initiatives, Mexico City emerged as the leader in smart governance in Latin America. Mexico City has also been an early player in the region in promoting smart and green buildings. In fact, they are one of the first cities in the world to experiment with technology allowing buildings to actually absorb nearby smog. On the transportation front, I have been impressed with some of their leadership in the region. For example, they were an early mover in the introduction of a bikesharing program. They currently have nearly 4,000 bikes with plans to get to 6,000 in the near future, dwarfing any other such program in the region. In 2012, the City supported the introduction of the first scalable carshare program in the region, which now contains more than 40 vehicles, some of which are EVs. I was actually less surprised with Bogota’s top three placement in this ranking as I have visited Bogota a dozen times and have observed the city’s impressive transformation. Like all cities on this list Bogota has major problems with traffic congestion, perhaps more than most. Yet they have done more than most cities in the region to address it. Bogota’s bus rapid transit system (BRT) is among the most extensive and utilized systems in the world (1.65 million daily riders). Bogota also has an impressive system of dedicated bike lanes interconnected with their BRT system, Transmilenio. Bogota is unveiling a large bikeshare program, and more impressively is, to my knowledge, the first city in the region to begin introducing an EV taxi fleet in partnership with BYD. The government also announced plans to construct an electric underground metro system within the decade. My last home before moving to Santiago, Buenos Aires is a culturally vibrant, creative, entrepreneurial city. And the city is not resting on its laurels. Behind the vision of the Ministry of Urban Development and its visionary leader, Daniel Chain, Buenos Aires has combined urban renovation with cluster development by investing in new infrastructure in blighted areas. In the past few years, Buenos Aires has implemented technology, design, arts, audiovisual production, pharmaceutical, and entertainment clusters representing 7,500 acres and supporting 150,000 jobs. Like all cities in the region, Buenos Aires has its share of transportation headaches. But recently they have expanded their own network of BRT lines and also begun supporting enhanced cycling infrastructure and bikesharing. Finally, Buenos Aires is unique in having an entire ministry devoted to becoming smarter, called the Ministry of Modernization. The Ministry has been responsible for some innovative smart cities projects such as the implementation of an expansive public Wi-Fi network. All of the advances in Buenos Aires come in stark contrast to Santiago with respect to national government support: The current national policies in Argentina are disincenting entrepreneurship, contributing to significant inflation, and talent and capital flight. The first Brazilian city to crack the top 10, Rio is building up towards the 2014 World Cup and the 2016 Summer Olympics (though not without issues both immediate and overarching). Like other Olympic cities before Rio, the city is using the infusion of capital to make the city smarter and more sustainable. This of course has not been without controversy, particularly with the riots that broke out when the government sought to raise public transit fares. Yet, Rio is a city on the path. It is trying to address its issues with income inequality and leveraging smart solutions to enhance the quality of life for all its citizens. The much hyped integrated operations center developed with support from IBM, allows for real-time monitoring of meteorological, crime, traffic, live camera feeds, and emergency data. In fact, the idea for the center was born out of the mayor’s frustration with the regular injury and loss of life in the poor favelas on hillsides due to heavy rains. Using sensors in the hillsides combined with meteorological data and new communications tools, the integrated center is equipped to predict mudslides and warn communities in advance. Another ongoing project involves hiring local teenagers to take digital images of problem areas in the favelas in an effort to create a digital map of hot spots and enabling city staff to begin tackling challenges such as removing accumulated trash which attracted mosquitoes and contributed to higher incidences of dengue fever. Curitiba has been a pioneer in the region in embracing smarter urban planning and introducing new modes of transit. In fact, Curitiba’s former mayor, Jaime Lerner, is credited with the invention of Bus Rapid Transit systems which have now been embraced throughout Latin America and the globe. Curitiba is also working on a new light rail system which will be interconnected to their expansive BRT system. Curitiba has also been smart in addressing climate resilience by creating green spaces which during rainy season are used to absorb runoff and in dry season, convert to beautiful parks for use by locals and tourists. Curitiba is regularly considered the greenest city in Latin America and was honored as such in the regional Green Cities ranking by Siemens a few years ago. This is another city I had a chance to visit during my frequent travels to Bogota. Medellin has undergone a nearly miraculous transformation from a drug capital with heavy violence and crime to a greener, smarter and more inclusive society. The much talked about (and deservedly so) introduction of gondolas and electric staircases implemented to support the integration of the poorer hillside communities with the rest of the city have become an icon for inclusion and smart transit. Medellin also invested in an expansive metro system bigger than most for cities of its size (3.8 million people). The city has worked hard to create quality, attractive infrastructure including new libraries and museums in an effort to improve the quality of life and local pride. Medellin is fast becoming an international tourist destination while also attracting civic-minded entrepreneurs. For its efforts, Medellin was awarded “Innovative City of the Year” by the Wall Street Journal, Citibank, and the Urban Land Institute as part of a global competition. With less than 2 million inhabitants, Montevideo is a more compact, slower paced Latin American capital city and it shows: Montevideo is regularly ranked to have the best quality of life in Latin America. Another strong suit for Montevideo is its thriving tech center and entrepreneurial culture. Montevideo boasts several strong universities with active programs to support technology entrepreneurship helping Uruguay become the largest per capita software exporter in Latin America. Yet despite these impressive accomplishments, Montevideo is still a long ways away from being a holistic smart city. Weak commitment to public transit, green buildings, and digital governance suggest this city has an uphill climb to move up in these annual rankings. While other cities in Latin America are headed generally in the right direction, no other cities (for which I was able to obtain data) qualified to make the top 10 list. In the runners up category were Lima, Peru, and Quito, Ecuador. In the “others receiving votes category” included Monterrey, Panama City, Santo Domingo (Dominican Republic), and Sao Paulo.